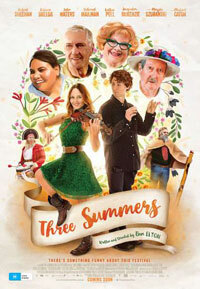 Internationally renowned writer/director Ben Elton’s new comedy Three Summers opens in local cinemas on November 2. It’s an ensemble comedy which follows the annual festival goers at a regional music festival over three consecutive years, focussing on the difficult relationship of feisty lead singer of an Irish folk band (Rebecca Breeds) and a folk music-hating Theremin player (Robert Sheehan). Characters surrounding this awkward romance include a fiercely Aussie Morris Dancer (Michael Caton), an Indigenous dance troupe, a group of boozy baby boomers, a power tripping security guard, a wannabe girl rock band and even some musical asylum seekers. In fact, all manner of stories collide under the meddling eye of community radio super star, Queenie (Magda Szubanski). Fusing romance, music and Ben Elton’s trademark sharp political wit and satirical edge, Three Summers delivers an engaging folk tale of contemporary Australia with the soundtrack and the belly laughs for the summer to come. Also starring Deborah Mailman, John Waters, Kelton Pell, Jacqueline McKenzie, Peter Rowsthorn and The Bondi Hipsters’ Christiaan Van Vuuren and Nick Boshier. M from Nov 2. Thanks to Transmission Films we have 5 double in-season passes to give away. It’s not hard to enter – all you have to do is email us at info@ciaomagazine.com.au with your name and postal address and let us know you’re interested. We’ll let you know if you’ve won.